Hi all. Can anyone help identify the maker of this small cream ladle? It is about 10cm long. The maker's mark is stamped on the front of the stem where the handle joins the bowl. It is in an oval punch. There are no other marks. 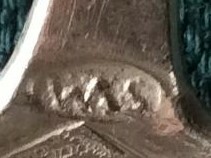 The maker's mark could be WAS, with the W and A conjoined, but the mark is not very clear and it could be something different. Any suggestions?? WAS no entries. Difficult one. Could it read W.S in an oval shield? Without town mark difficult to attribute. Source; Amsterdamse Zilversmeden en hun merken K.A. Citroen; SVM conjoined for; Pieter Staats van Mecklenburg, registered in Amsterdam, 1779-1811(died), work small silver tableware. 1795-1815 Turbulent time period, today called The Netherlands occupied by French troops and under French law. 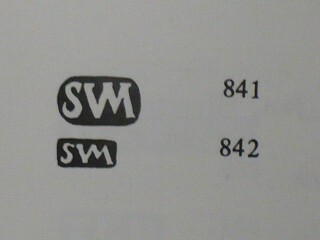 Introduction of various new (hall)marks, hence the absent of any hallmarks. Depending which guild city town assay office, early 18th century cream ladles often marked at the reverse of the stem. Later 18th century around 1800 often marked front of stem, close to the bowl. However the maker's mark on your cream ladle is the right way up with free space for an assayer to put the hallmarks under the maker's mark.